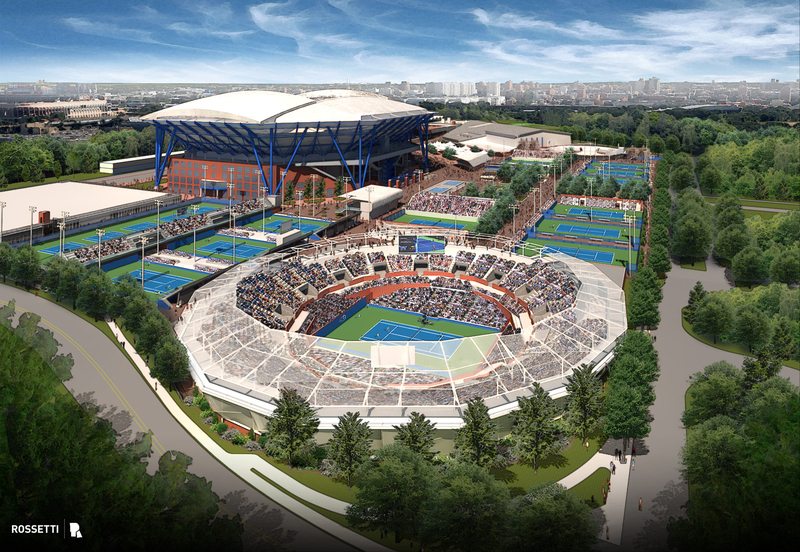 The USTA on Thursday announced its plans for a sweeping transformation of the USTA Billie Jean King National Tennis Center that will include building a retractable roof over Arthur Ashe Stadium, and the construction of two new stadiums. The transformation will be implemented in three phases to begin at the conclusion of the 2013 US Open, with the goal of overall completion by the 2018 US Open. The completion of the retractable roof for Arthur Ashe Stadium is scheduled for August 2017. The cost for this historic transformation is estimated at $550 million, including the cost of the retractable roof, estimated to cost in excess of $100 million. As it has done with improvements to the National Tennis Center in the past, the USTA will self-finance the entire cost of this transformation through a combination of bonds and USTA revenue generation. Since 1994, the USTA has invested more than $500 million in improvements to the site. 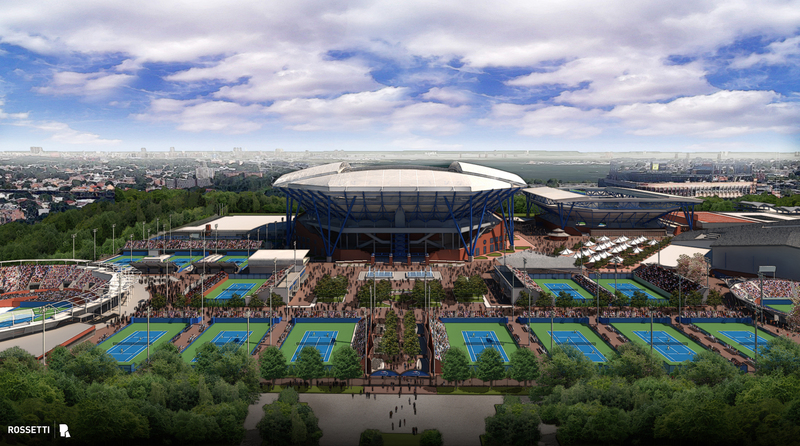 In addition to the roof on Arthur Ashe Stadium, phase one of construction is scheduled to include the shifting of the existing practice courts and two tournament courts to the north. This will allow the construction of an expanded viewing area for the practice courts and the three new tournament courts. This enhanced fan experience will require the re-building of the current transportation facilities located adjacent to Arthur Ashe Stadium. The retractable roof is being designed by ROSSETTI, the designer and architect of Arthur Ashe Stadium. The USTA has hired Hunt Construction Group to build the retractable roof structure. Hunt has a long and impressive track record of sports facility construction in New York City, including construction of the Barclays Center and Citifield. As designed, the retractable roof constructed of flexible, translucent PTFE fabric stretched over a steel frame, will be supported by eight steel columns surrounding Arthur Ashe Stadium. Phase two of the transformation will be anchored by the construction of a new 8,000-seat Grandstand Stadium in the southwest quadrant of the Tennis Center. Simultaneously, field courts 7 through 16 will be moved south so that a larger pedestrian and fan esplanade can be created, better connecting the new Grandstand with Court 17. This southern expansion also allows the USTA to further enhance the fan experience, with a new additional food court, new merchandise locations and sponsor exhibit booths, and other fan amenities across the southern expanse of the Tennis Center. The project’s final phase will include the construction of a new 15,000-seat Louis Armstrong Stadium. The USTA expects final design work for Armstrong to be completed in the next 12 to 18 months. The targeted completion date of the stadium, which will be built “roof-ready,” is August 2018. Also during the third phase, the USTA will complete a series of upgrades to the East Entrance, the most trafficked entry point to the US Open. 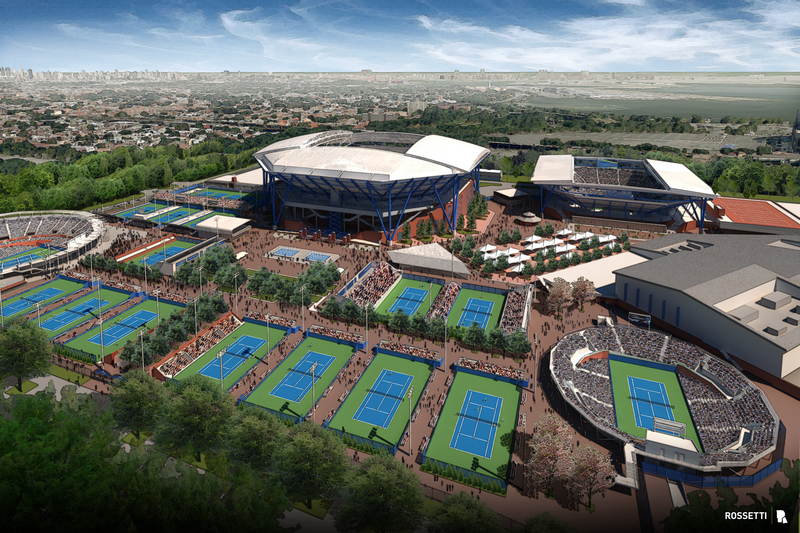 As a direct result of these collective enhancements to the NTC, the facility will be able to accommodate an extra 10,000 people each day during the US Open, increasing attendance by approximately 100,000 new visitors, and amounting to a significant economic boost to Queens, New York City and the entire metropolitan region. For more information on this project, visit www.usta.com.